Contractors can quickly and easily locate homeowners and businesses which need repairs from hailstorm damage after recent hailstorms using SWIFT Weather’s newly updated website LiveHailReports.com. Contractors will benefit and profit from using the new web-based software that works on any computer – including a new Summary Reports hail tracking product providing instant access to detailed and easy-to-read hail reports in a particular city. Contractors can quickly and easily locate homeowners and businesses which need repairs from hailstorm damage after recent hailstorms using SWIFT Weather’s newly updated website LiveHailReports.com. “Hail tracking with our detailed hailstorm damage summaries and street-level graphics allows contractors to quickly identify people who need their services,” said SWIFT Weather CEO Rory Groves. Hail tracking for contractors before and after recent hail storms is now easier with LiveHailReports.com– the newest online weather-tracking product suite from the award-winning weather software developer SWIFT Weather. The new hail tracking software provides real-time and recent hail storms damage reports enabling contractors to locate residential and commercial properties which need their services after hailstorm damage, wind and tornado damage. Contractors especially will benefit from the new easy-to-use, printer-friendly Summary Reports feature that lets the user find any hail, wind or tornado report in the last five years up to the present. Street-level graphics show exactly where the hail fell and the simple online search by city and date lets contractors find individual storms or all storms for a selected city. “Hail tracking with our detailed hailstorm damage summaries and street-level graphics allows contractors to quickly identify people who need their services,” said SWIFT Weather CEO Rory Groves. “Our hail reports are very affordable and hands-down the most bang for your buck on the market,” concluded Groves. In addition to the new Summary Reports on LiveHailReports.com, other products also include Real-Time Hail Tracking enabling contractors to beat their competitors to a job by pinpointing the exact location of homes and businesses which have suffered recent hailstorm damage – anywhere in the United States –showing up-to-the-minute activity. With this product an aerial photography map of homes and businesses is interactive, allowing the user to export data to Microsoft Excel or Google Earth. In addition, Historical Hail Data web-based interface product allows users to look up a year’s worth of hailstorm damage reports at one time. Quickly browse through a listing of hail reports for a particular state and plot over an interactive map and export data to Microsoft Excel or Google Earth. All LiveHailReports.com’s products are web-based software and compatible with any computer. Pricing is $49.95 per Summary Report or $149 per month for unlimited access to all citywide Summary Reports (up to 80% discount, depending on the month). Visit http://livehailreports.com/ for more information or to purchase. 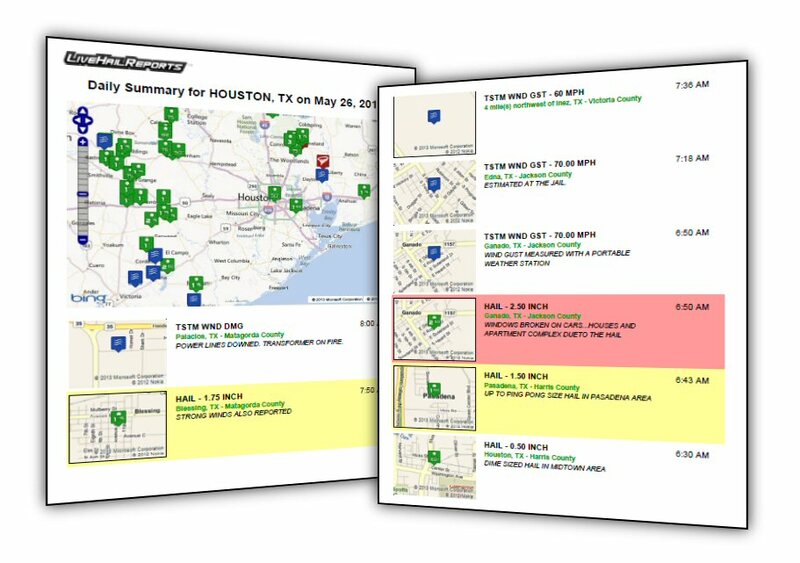 Contractors will benefit from the new easy-to-use, printer-friendly Summary Reports feature that lets the user find any hail, wind or tornado report in the last five years up to the present.Street-level graphics show exactly where the hail fell and the simple online search by city and date lets contractors find individual storms or all storms for a selected city.